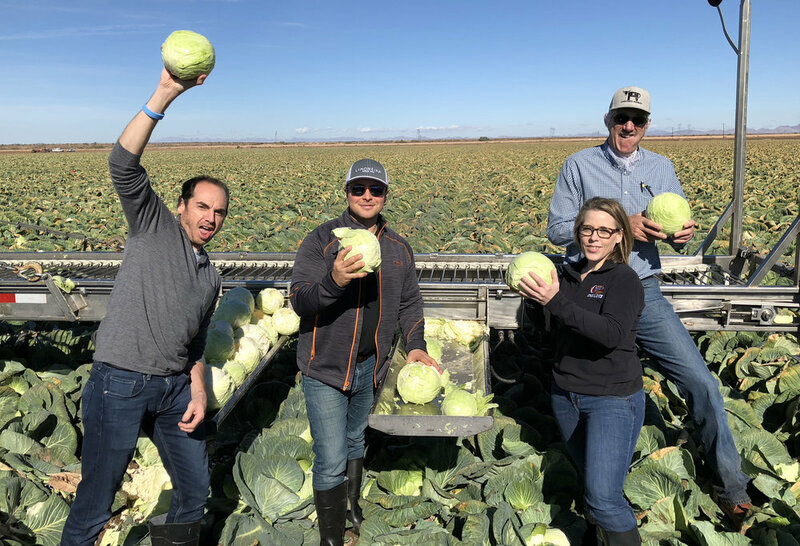 This month, the Produce Alliance team traveled to Yuma County in Arizona, the nation’s third largest vegetable producer and the winter lettuce capital of the world, visiting the fields and facilities of our partners at GreenGate Fresh. Each fall as the seasons begin to change, growers transition crops from Salinas, CA to Yuma, AZ to ensure consistent quality and customer satisfaction. According to past agricultural statistics, Yuma County produces up to 50,000 acres each of head lettuce and romaine, about 12,000 acres of broccoli, 3,500 acres of cauliflower, 6,800 acres of spinach and 3,000 acres of other vegetables yearly. Yuma is also Arizona’s top producer of lemons, tangelos, and tangerines, and leads in watermelon and cantaloupe cultivation. It takes approximately 45,000 workers to harvest the fields and work in the nine salad plants that produce bagged salad mixes. During peak production months, it’s said that each of those plants processes more than two million pounds of lettuce per day. Click here to read more on Yuma County and America’s winter vegetable capital. Thank you so much to everyone at GreenGate for touring us through their gorgeous cabbage and lettuce fields and facilities! As always, Produce Alliance is your source for insider coverage, market updates, and produce expertise all the way from field to fork. For weekly produce updates straight from the fields and our PA procurement team, click the link below to access the official PA Market Report, distributed every Thursday with full market briefings. Produce Alliance specializes in providing fresh produce category management services including procurement, national distribution, information services, and food safety assurance to food service clients across North America, the Caribbean and beyond. They manage an alliance of 50+ independently owned specialty distributors of fresh products, with combined produce sales of over $4 billion annually.